We became the Highest Rated Film on Durango website today - thanks to all who voted for us, and especially those who wrote comments. Those mean a lot. We were just invited to screen at the Boston International Film Festival, Apr. 17-26. And the programmers of Monterey's Golden State Film Fest have paired L&RK with James Ivory's SHAKESPEARE WALLAH. I'll be in Monterey Mar 26 to introduce my film and speak about Jim's (which was made a very long time before I started working with him!) 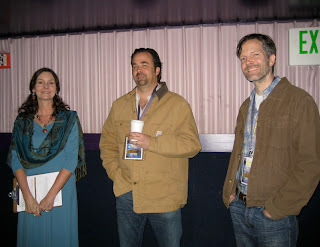 This photo from our screening in Sedona with filmmaker Phil Noyes and our screening's host. Just back from four days at the Sedona Film Fest where LOVE AND ROADKILL showed to the most appreciative audiences yet. Long Q&A's after both screenings with thoughtful questions and discussions continuing long after we were booted out of theater. A retired local drama teacher cited the line "that wasn't in the papers" as her favorite moment (mine too!). 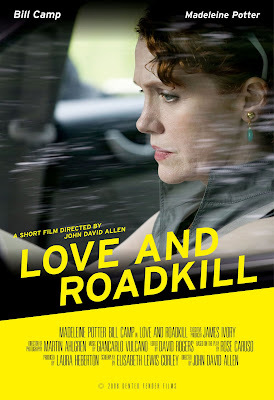 Filmmakers Troy and Frances Perkins asked if they could use LOVE AND ROADKILL in their classes at the U of Wisconsin (yes, gladly). Many thanked us for making a film with serious subject matter that is also optimistic, fairly light-hearted and short. We were paired with Phil Noye's great doc WOMEN IN BOXES, a good fit. Many of Phil's fans are now our fans and vice versa.